Bitcoin Casino Sites bring you one of the most experienced casino sites in the Bitcoin world called Fortune Jack. This sleek and stylish site state that their core values are ‘providing customers with a diverse gaming choice, unbeatable service, honest, integrity and provably fair gambling for all levels’; sounds great to us but can they deliver? Customer service is great but remember it’s all about the games! So you’ll be delighted to know that Fortune Jack have a huge range including Bingo, Roulette, Blackjack, Poker, Keno and Slots such as the impressive Angry Birds, Always Hot and Beetle Mania. Registering is easy because all you need is a Bitcoin wallet to store your currency. Bitcoin Casino Sites recommend Coinbase, an organisation which specialises in cryptocurrency and offers a wide range of facilities to accommodate all of your needs. Once you’ve registered with Fortune Jacks then you can take advantage of their 1st deposit 100% cash match bonus up to 1 BTC (Bitcoin), which is added to your account straight away. So if you take advantage of this incredible offer and deposit 1 BTC then you’ll walk away with 2 BTC in total to play with; that sounds great to us! Unlucky Jack – Every Monday at 11:00 Fortune Jack will reward the top 3 unlucky players of each week with 20% cash back of their net loss. They will contact you to confirm if you will receive this incredible bonus. Most Active Chat User – Every Thursday at 11:00 they will reward the top 5 chat users, which basically means those who write the highest number of posts. 1st place will receive 0.004 BTC, 2nd place 0.003 BTC, 3rd place 0.002 BTC and 4th and 5th place will receive 0.001 BTC. It’s easy to earn free Bitcoin with Fortune Jack, you simply need to chat! 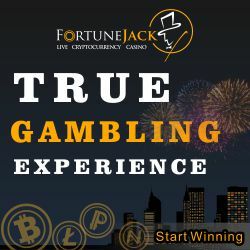 Jack’s Fortune – Every Tuesday at 11:00 Fortune Jack reward their members who wager at least 0.001 BTC on every game in their range, with a whopping 50 loyalty points. Everyone loves a bit of competition and with Fortune Jack you can not only game for fun but also to become the top of their leader board. They offer leader boards for 10 of their games and the top 5 players are rewarded, based on the points they have accumulated. 1st place will receive 0.5 BTC, 2nd place 0.3 BTC, 3rd place 0.1 BTC, 4th place 0.06 BTC and 5th place 0.04 BTC. The winner are announced every Friday, so make sure you keep an eye out on your account. With so many freebies on offer we’re sure you’re already eager to register, but wait until we tell you about Fortune Jack’s loyalty programme. As a thank you for playing on the site they will give you loyalty points simply for playing. You’ll earn one point for every 0.001 BTC you play and these points can be redeemed as future gaming credit. The loaylty scheme is based on 4 tiers which include Bronze, Silver, Gold and Platinum. Each offer bigger and better rewards such as exclusive giveaways and a personal accoutn manager. One of the benefits of gaming with cryptocurrency is the flexibility available when it comes to banking. This is definitely the case with Fortune Jacks ‘Person to person coin transfer’ where you can move Bitcoins from your wallet to someone elses. There is no maixmum limit set on P2P transactions but there is a 2% fee on any amounts over $200. Fortune Jack offer a dedicated 24/7 customer service via email to support their players. So if you have any questions or issues simple click the contacts tab. For the social media fans out there make sure you check out Fortune Jacks Facebook and Twitter pages for the latest games and promotions. They accept a number of cryptocurrencies including Bitcoin, Peercoin, Litecoin, Novacoin, Dogecoin and Redcoin. So if you’re ready for some incredible gaming on the future of online casino, then simply CLICK HERE and we’ll take you through to register and claim your 1st deposit bonus.